Adrienne Rich: poet, essayist, feminist, champion of social justice, teacher, friend. 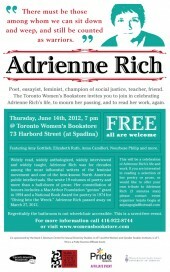 The Toronto Women’s Bookstore invites you to join in celebrating Adrienne Rich’s life, to mourn her passing, and to read her work, again. Speakers: Amy Gottlieb, Elizabeth Ruth, Anna Camilleri, Nourbese Philip, Kate Sutherland, Simone Weil Davis and more. Location: Toronto Women’s Bookstore, 73 Harbord Street (at Spadina). Widely read, widely anthologized, widely interviewed and widely taught, Adrienne Rich was for decades among the most influential writers of the feminist movement and one of the best-known North American public intellectuals. She wrote 19 volumes of poetry and more than a half-dozen of prose. Her constellation of honors includes a MacArthur Foundation “genius” grant in 1994 and a National Book Award for poetry in 1974 for “Diving Into the Wreck.” Adrienne Rich passed away on March 27, 2012. This will be a celebration of Adrienne Rich’s life and work. If you are interested in reading a selection of her poetry or prose, or would like to offer your own tribute to Adrienne Rich (3 minutes max) please contact event organizer Anjula Gogia at anjulagogia@hotmail.com. Regrettably the bathroom is not wheelchair accessible. This is a scent-free event. Free – all are welcome. For more information call 416-922-8744 or visit www.womensbookstore.com. Co-sponsored by the Mark S. Bonham Centre for Sexual Diversity Studies and the Women and Gender Studies Institute. This is a Pride Toronto Affiliate Event.